There is not a lot of information available about individual models of firearms that Iver Johnson manufactured. Iver Johnson started out in 1871 as Johnson Bye & Co., in 1883 the name of the company was changed to Iver Johnson & Co. and in 1891 the name was changed again to Iver Johnson's Arms & Cycle Works. 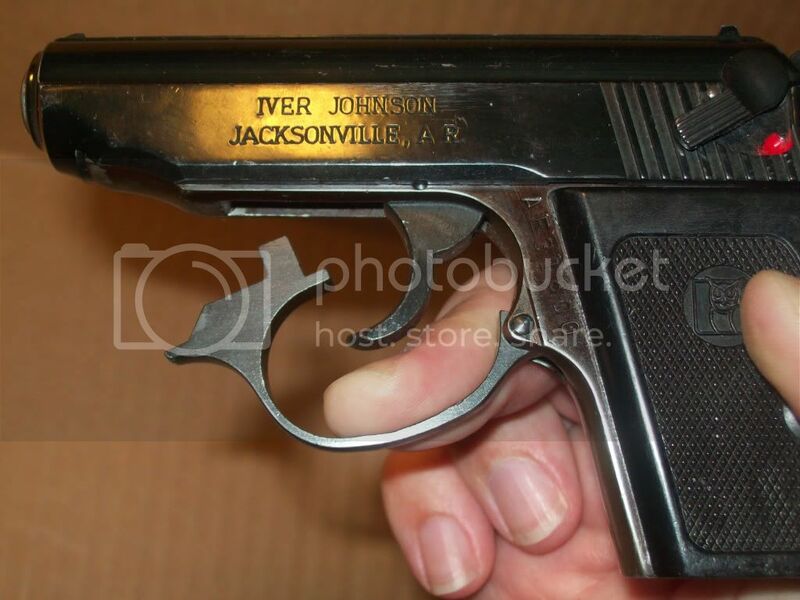 Iver Johnson produced firearms under various names and owners form 1871 until 1993. The TP22 pistol was added to the company’s line after their move to Jacksonville, Arkansas in 1982 and last manufactured in 1990. In 1993 when operations ceased, Iver Johnson was owned by American Military Arms Corp. (AMAC). Iver Johnson gained a reputation over the years for producing low cost, sturdy, reliable firearms. It is said that many LEO’s (Law Enforcement Officers) used the TP22 as a BUG (Back-Up Gun). I borrowed this .22 LR from a friend of mine. 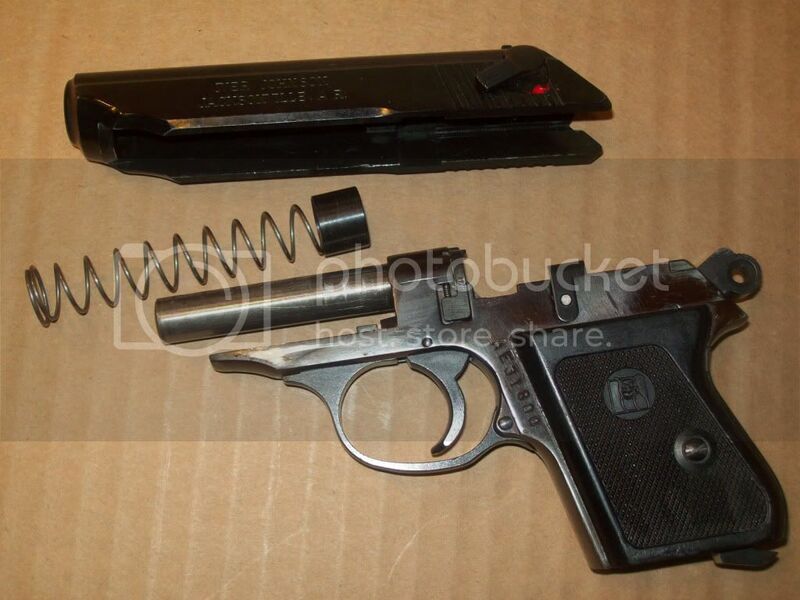 It’s a sleek, Walther PPK looking pistol with a heavy metal feel to it. Fully loaded, this little “mouse gun” is 15.3 oz and feels nice in the hand, although the grip is too short for comfort. It is a SA/DA (Single action/Dual Action) with a thumb hammer-block safety. The magazine release is on the bottom by the magazine. 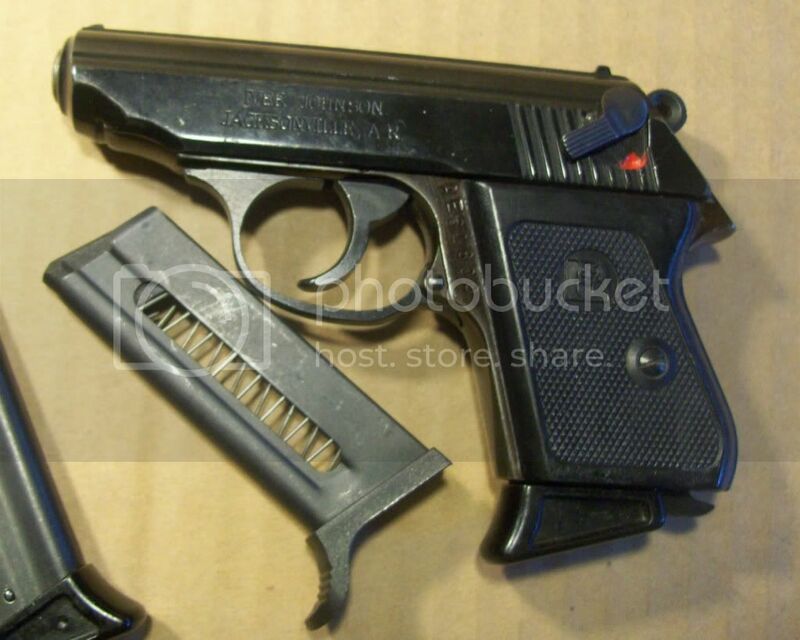 Parts are almost impossible to find, although you can still find these guns new on auction sites for around $200. Shooting the Iver Johnson TP22 is easy and pretty accurate, considering the caliber and overall size of the gun. I had a good 2 inch grouping at 7 yards although I found myself aiming a little high and right in order to hit center. Angela tried this pistol and shot about the same as with our Walther P22. We never had a failure shooting through many refills of its 7 round magazine full of Federal value ammo. Disassembly was an experience and something new. 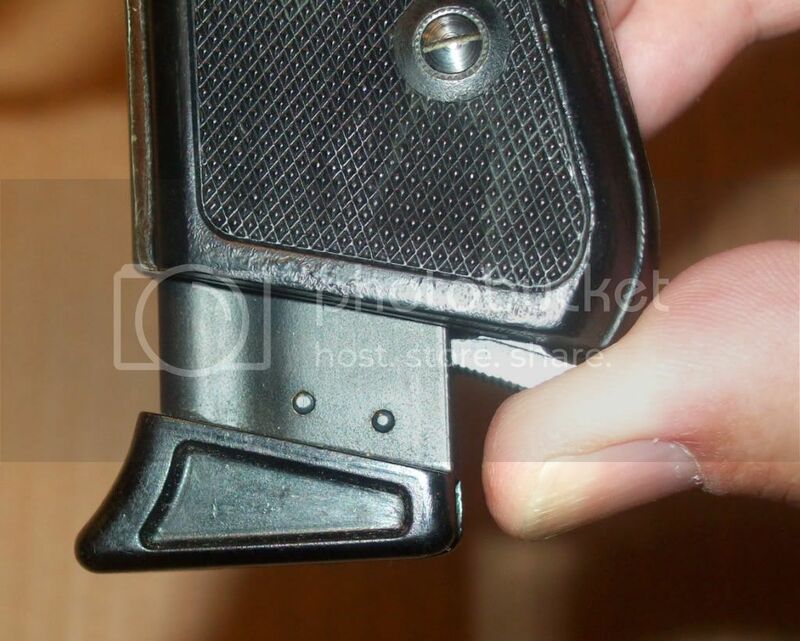 The trigger guard pulls down in order to release the slide. Holding the trigger guard out, you pull the slide back past the trigger, tip it up and then slide it off the barrel. There is a spring and guide bushing around the barrel, which is attached to the frame. Reassembly requires sliding it back in reverse order while keeping that trigger guard out of the way. The Bad: This gun does have its evil side. 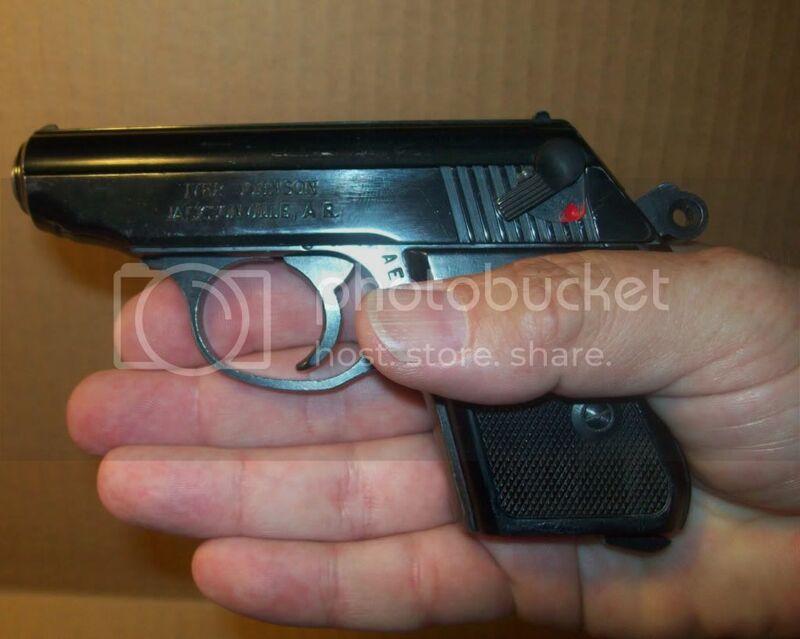 The beavertail on this gun is so small that it is VERY easy to get your hand higher than the slide level. You have to take the time to position your hand below that level or suffer a cut … like Sharon did. It was a very small cut (more of a nick, really) and everything is fine. 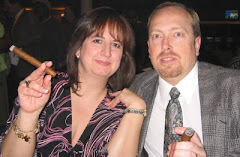 I coached Angela on that hand position before letting her fire it. Summary: A nice little .22 for its time and still a good gun. I would probably choose a mousey .380 of equal size and weight over a .22 to carry, though. It is a fun, sleek looking gun for the range or plinking. I had one of these in the '70's. It had a bad habit of double firing occasionally and triple firing a couple of times. I sold it to a guy who just wanted to own a gun! ...I had mine fire and take out a window when I racked one in! Saftey was ON! That was 17 years ago and I've not fired the gun but a few times since. And I just don't feel right selling a gun like that... Just be careful! Agreed on the cheap ammo comment. You need to also use high velocity or the gun will not eject properly. I picked one up used (though never fired) for $150.00. I really enjoy it. Bought in 1980 for $65.00 S/N 00910 has never had a problem keep them clean and shoot the good ammo. I still think as a old timer guns are one of the best investment anyone can make forget CD's and other investments and thanx to our goverment I'll take 33% on my money over 30 years. I Love mine, for size its accurate and cheap to take to the range for practice. Has to be kept clean and is picky about ammo. I use Remington standard velocity. I tried champion federal high velocity and it wouldn't eject. I purchased mine new in the mid 1980's, it has proven dependable. I fired 100 rounds of CCI Blazer ammunition yesterday without a failure. Sights are crude but functional. Have had this little gem for about 25 years. Was cleaning it today and the slide came off the gun. Had a heck of a time putting it back until I read your blurb about keeping the trigger guard down.Slid right in to place.I had lost the box and the instructions.It had been a while since I shot it. Love the little darling as a backup. 25 years and you never took the slide off? Did you ever clean it the proper way ??????? Lucky you. Love to see a pic of the plated gun. I've had a TP22 for fifteen or so years, now. I stoke it with CCI Stingers. The gun is as reliable as can be and, actually, pretty accurate. Never a FTF or FTE. I'm not goingto part with mine! Yes... it is a BUG. Does anybody know where I can get extra clips on line ? TripleK has them listed on their web site at $38, as of March 28, 2015. LENGTH OF MAGAZINE - 3.00"
Introduced in 1981 and discontinued in 1986, the pistol was reintroduced by a new Iver Johnson Co. in 1988. Double action automatic, hammer safety, polished blue metal.